December 2010. It’s hard to believe that another year is drawing to a close, isn’t it? While flipping through my garden journal last week, I couldn’t help but marvel at how different the weather and crops were in 2010, compared to 2009. I just started a new section in my blank book to record observations on my winter vegetable garden (crops grown beneath hoop houses as well as horticultural pursuits indoors), and to make plans for spring 2011 planting. Keeping a permanent record of your garden is one of the keys to horticultural success -and it’s also fun! I have a practical garden calendar/record (day-runner type with 3-ring binder and handy pockets for seeds and tags) where I keep dated notes on seed sowing and vegetable/fruit harvests, crop rotation maps, location records/photos, pest notes, fertilizing reminders and so on. But I also have a more traditional free-form journal (pictured above and just below) for thoughts, observations and sketches. This is the time of year when I usually order new inserts for my three-ring binder garden calendar/record and replace my free-form journal if necessary. Sure, I keep notes on my laptop and iPhone too, but I enjoy the process of sketching and writing with pen on paper. And over time, I have learned the hard way that electronics, mud and water aren’t really the best of companions. In addition to laying out next year’s vegetable garden —rotating crops helps prevent repeat insect infestations and diseases— I’m also planning what varieties to plant based on past seasons. I have limited space in my potager, and I want to get a head start on orders before companies sell out of the choicest seeds. 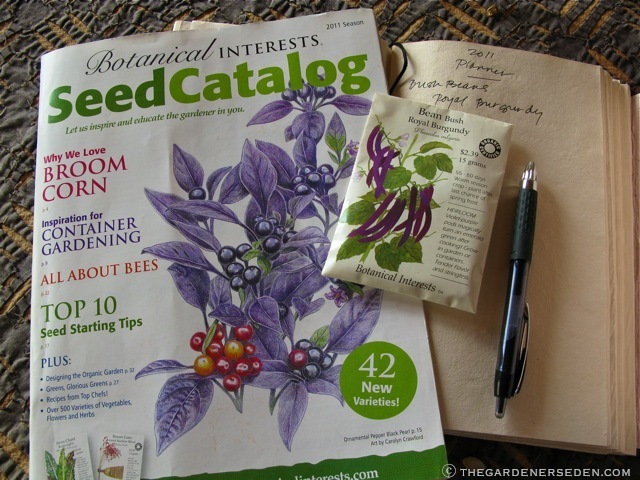 The Botanical Interests 2011 seed catalog arrived in my mailbox last week, and I have been circling items to order both for holiday gifts and for my own spring garden. My journal is helpful with this planning and ordering process, because I have written down which varieties of vegetables and herbs performed well in my garden, which did not, and which varieties I would like to try based on friends’ success. Every year, some companies discontinue seeds and others offer new varieties. So, as seed catalogs arrive, I scan lists to see where I can find and order my favorites (or, make a note to save my own seed when possible). 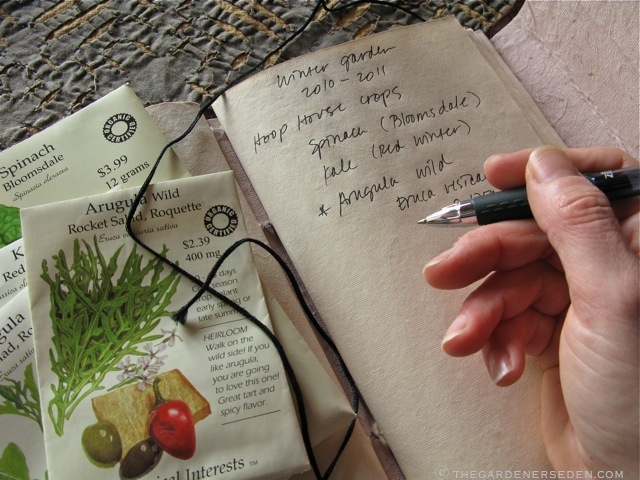 A durable and beautiful garden journal makes a great gift for a new gardener —or any gardener not currently keeping one— particularly if it’s personalized with a few favorite seed packets, photos, notes, web-links, or even a gift certificate to a local garden center or online retailer, like Gardener’s Supply Company. 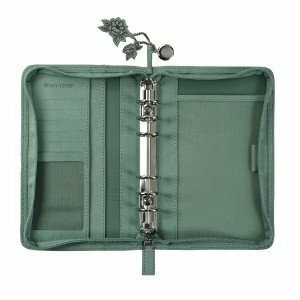 If you —or the gardener you are shopping for— have a large garden, then consider a 3-ring binder type of journal cover and fill it with a calendar/notebook. A beautiful leather journal cover can be re-used from year to year, and makes a great gift. 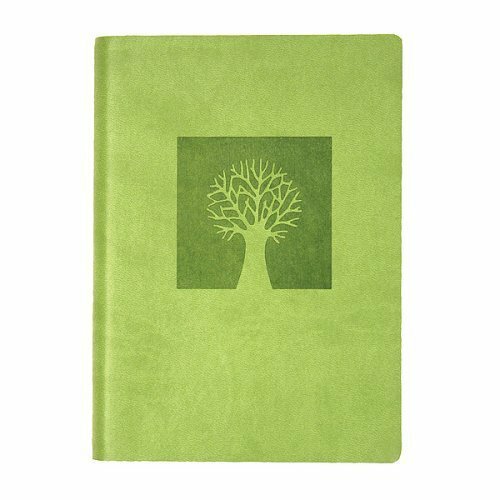 There are literally hundreds of notebooks, calendars and covers to choose from, but when you are shopping for a horticultural journal, keep in mind that for most serious gardeners, an easy-to-clean cover in leather or vinyl is really essential. Replaceable annual-calendar inserts make sense, as do extra plastic pockets. I like the day-timer style garden journals because they are flexible and can be used/filled anyway you like. Mine is the ring-binder type with plastic pockets and zip-lock pouches for seeds, tags, business cards, etc. 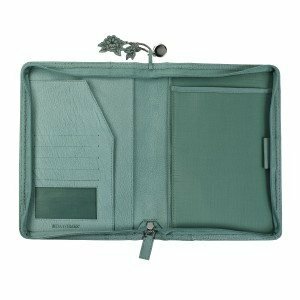 This Garden Journal Leather Cover is nearly identical to the one directly above it, but it has a handy metal binder for loose leaf paper, calendar inserts and additional plastic pockets. I prefer this kind of journal for my day-to-day record keeping in the garden, because it keeps everything together. If I need to add more plastic pockets, I just swing by a local office supply store and match the stock to my binder. 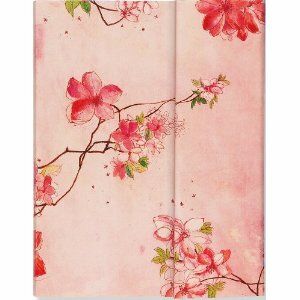 Pretty, Simple and Inexpensive: Blossom Journal (Magnetic Closure). I’d choose this type of journal for a more meditative garden-writer or someonealready in possession of a task-oriented horticultural binder. If the gardener you are shopping for tends more toward free-form record keeping or simple journaling, then a blank book would be a good choice. This type of journal is usually less expensive than zippered, three-ring-binder calendar/journals. 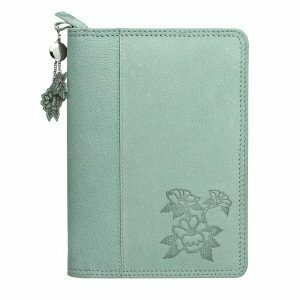 A good, heavy cover is still important, although choosing a blank book with a pretty botanical theme seems right. 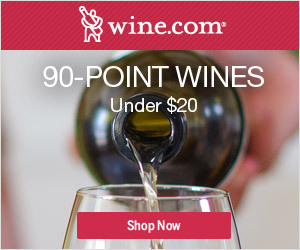 I just ordered two journals (the one just above and below) as gifts. Will I keep one for myself? Hmmmmmmm…. Please note: The Gardener’s Eden is not an affiliate of Botanical Interest Seeds, but Michaela is a long-time, happy customer! You are currently browsing the Record Keeping category at The Gardener's Eden.